Studying Nursing at the University of Iowa has been the most challenging, rewarding, and inspiring experience of my 21 years thus far. Ten years from now, I see myself as a Neonatal Nurse Practitioner working full time in a NICU, providing extraordinary care to neonates and their families. To say that pediatric nursing is a clinical interest or a preference of mine wouldn’t nearly be enough. My passion for providing care to children and babies is as deeply ingrained in me as my heart and soul; it is something that makes up the very fiber of who I am. Pediatric nursing is not just my goal, but my vocation: a path I feel so inherently suited for and confident about that I couldn’t imagine dedicating my life any other way. Neonates need not only a dedicated, competent nurse, but also a motherly figure for when mom is gone. They need a voice for when they cannot speak and eyes and ears to monitor their health and direct their care when they cannot. They need critical thinkers, clear communicators, detail-oriented observers, and emotionally stable supporters. Since I joined Chi Omega, I have been incredibly blessed to belong in a sisterhood of women who provide each other with genuine care and support similarly to the care I value so much in giving my patients. My Sisters in Chi Omega are my eyes, ears, shoulders to lean on, cheerleaders to find perseverance in, and above all, my family in a new and unfamiliar face. They push me to refuse to settle, and to remember to believe in myself when the stresses of college seem unbearable and my goals seem unattainable. Chi Omega has instilled in me leadership skills that I plan on translating into the workplace by becoming a leader in the nursing field, particularly by going back to school to become a Nurse Practitioner. I chose nursing because I believe in my capability and in my purpose. My Chi Omega Sisters are always there to remind me of this when I forget. Amy O'Grady teaches Kindergarteners about germs, through the Young Pediatric Nurse Clinicians Program. Chi Omega raises over $95,000 for UIowa Dance Marathon, FTK! Chi Omegas are passionate about their involvement in the University of Iowa Dance Marathon, truly making a difference everyday for children and families who are affected by pediatric cancer. As a leadership member, I was inspired by my fellow Chi Omegas who were both on leadership and dancers. They were always putting the kids and families before themselves and went above and beyond raising money FTK! (For the Kids!). Their enthusiasm for the organization never ceases to amaze me! 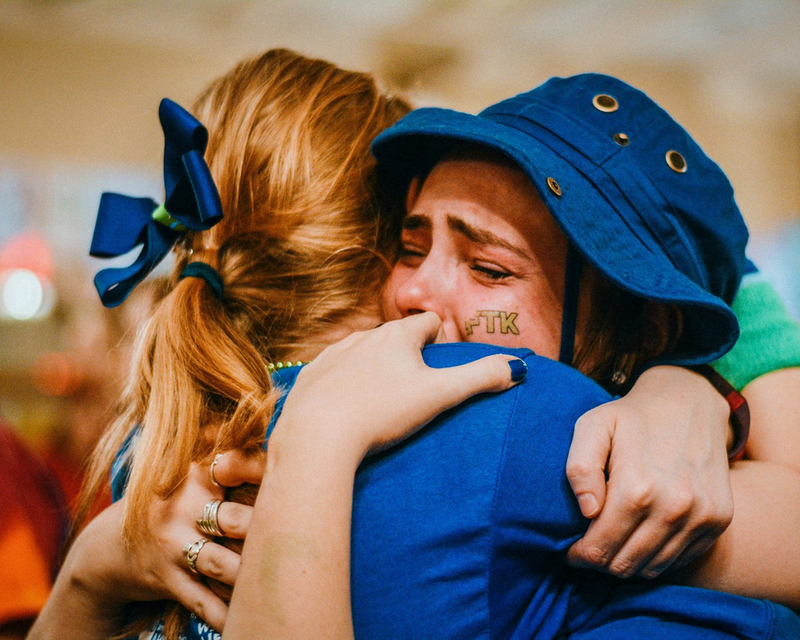 This Dance Marathon 22, Chi Omega broke the record for the top fundraising Sorority, raising over $95,000 which contributed to the final total of $2,424,031.22. As a result, we were awarded the amazing opportunity of going the Rec Center during the Big Event for an hour or two where we were able to do yoga, go for a swim, sit in the hot tub, or play pickup games of basketball or volleyball. $2,424,031.22 raised FOR THE KIDS! I could not be more proud of everything that Chi Omega has done for Dance Marathon 22 and I am excited to see how we make an even greater impact on the families this year! Our very own, Morgan Kennedy has been an amazing role model for all of us to look up to. This year she has been chosen as the Executive Director of Dance Marathon 23. I could not think of any other person who deserves this positive more than Morgan. She is going to blow DM 23 out of the water because of her outpouring love and dedication to this organization. Four Chi Omegas have been chosen for DM Chair positions. These ladies continue to show their love for this organization by taking on a big role for DM 23. As a chair they oversee the committee members and are constantly working hard to plan events, weekly meetings, and getting ready for the Big Event. Jestine, a Morale Chair, is one of four individuals who are in charge of 50 Morale Captains as well as 54 Morale Captain Assistants. This year I have been given the opportunity to serve on leadership as a Morale Captain. I could not be luckier to have Jestine leading all of us to be the best Morale Captains that we can be. Last year as a Morale Captain, Jestine was awarded the “Highest Overall Retention at 92.96%”. She never gave up on her dancers and was willing to go out of her way for every single one of them in order for them to get to the Big Event. I know she will push me to keep raising the bar to raise the most money I can for the families as well as getting my dancers to the Big Event. Jestine is the definition of a Morale Captain that went above and beyond for her dancers. We are so lucky to have her representing Chi Omega as Morale Chair for DM23! Dance Marathon has given me many opportunities in life that I would never have gotten had I not made the decision to join freshman year. Dance Marathon has not only changed my life but it has also guided me along the right path to my dream profession, Child Life. Child Life Specialist’s help children and families cope with the hospital experience. They provide procedural preparation and use play as a coping modality to make the hospital and medical language less scary for children. Marlee Speak, Kelsey Tebbe, and Annie Clendenen with fellow dancers during 'Power Hour' the last of the 24 hours of Dance Marathon. Dance Marathon has also led me to be a counselor with Children’s Cancer Connection, Camp Heart Connection. Camp Heart Connection is a week long camp in June for children who have had pediatric cancer. It is a place for them to go where they don’t have worry about kids staring at their scars or asking a million questions, because they have all gone through the same thing. They also offer a week long camp in August for the siblings of kids with pediatric cancer. This is a time for the siblings to be able spend time together in an environment where they are #1, and can bond with others who have dealt with the experience of having a sibling with cancer. This summer, numbers have risen and 5 Chi Omega’s will be attending camp as either a counselor or on another camp committee! I am so excited to welcome them into the Camp Heart Connection family! Dance Marathon is a proud sponsor of Camp Heart Connection. Marlee Speak and Kelsey Tebbe served as counselors for Camp Heart Connection this summer.They are both studying to become Child Life Specialists. As a founding purpose of Chi Omega, the importance of service to others plays a huge role in our lives. Chi Omega's alliance with Make-A-Wish has sparked a light in us, pushing us to fight for something bigger than ourselves everyday. So it's easy to see how our love for Make-A-Wish has also inspired our passion for Dance Marathon, where we dance for 24 hours to raise money and help kiddos battle a fight against cancer that no child should ever have to face. Chi Omega not only almost tripled the amount of money we raised last year with an outstanding number of $95,000, but had over 25 ladies hold various leadership positions for Dance Marathon, which is an entirely student run organization. We also had over 80 members of our chapter dance at the Big Event (you need to raise a minimum of $500 to attend), with several donating their hair as well. Paige Shockey even co-hosted a game of family feud with former Bachelor Chris Soules at Dance Marathon. Our business minded members had the opportunity to serve on the Business and Sponsorship Committees soliciting businesses for items to donate; restaurant gift cards to give to our Dance Marathon families, and collect and handle cash from family events and canning opportunities in the community. A few of our members had the opportunity to serve on the Development and Event Committees, brainstorming and planning all events that happen throughout the year and events that happen throughout the Big Event. A few other Chi Omega sisters had the opportunity to serve on the Family Relations cabinet directly working with our Dance Marathon families at family events. They worked inside of the University of Iowa Children’s Hospital, and help put together the family room at the Big Event that is magical for the families and kiddos to enjoy together. Last but not least, our creative Sisters had the opportunity to serve on the PR/Marketing Committee to brainstorm new themes, apparel, social media, and document Dance Marathon events throughout the year. When I joined Chi Omega, I never realized how impactful so many passionate, dedicated, and selfless women I would be surrounded by. I am so lucky to share my love and passion for Dance Marathon with so many of my Sisters that change the lives of those affected by pediatric cancer every single day. I think we could all agree that we knew we wanted to help change lives when getting involved in this organization, but little did we know how much it was going to change ours. Dance Marathon has led me to my future career of Child Life, further serving kiddos and families like the ones Dance Marathon has brought me to. It has completely led me to the purpose of my life where I can proudly support and uplift others. I can’t thank Dance Marathon and Chi Omega enough for inspiring me everyday, and for giving me the best college experience I could’ve ever asked for. Want to be a part of Dance Marathon 23? Sign up here! You can even choose to join a group lead by a Chi Omega!